Having had many careers, I became a mostly full time community musician in 2015. I had for many years been running small singing groups which are less formal than a choir and where the singing is combined with chat and support. 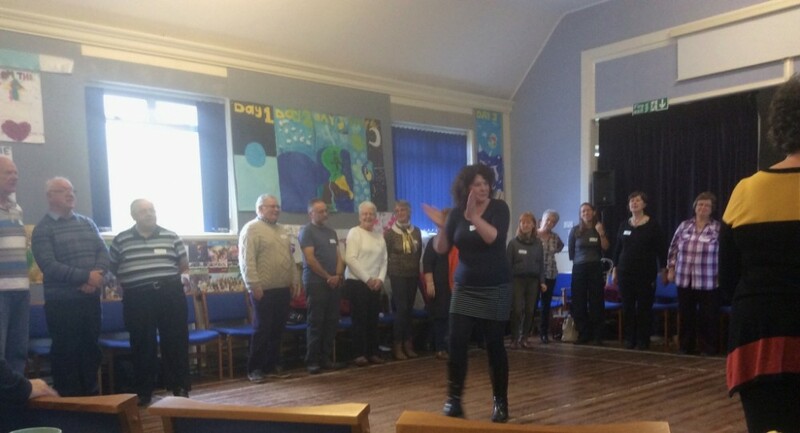 Sometimes these groups were run to help people recover from illness or cope with a long term condition and some were just simply community choir/singing groups. It became evident to me that singing and music are great healers. This got me interested in helping anyone access music and in doing so have fun, be less isolated, gain skills, confidence and all manner of wider health and well being benefits. I now help people learn music in lots of ways and tutor/coach not only singing, but ukulele, recorder and piano. I have been involved in taking forward community theatre projects and will continue to do so. I also write and arrange music, mainly for voice. As of 2019, I moved back to the Isle of Gigha where I will be setting up a music retreat space and B&B, as well as just breathing and enjoying the quiet of a Hebridean island. More to follow on this…. This website is evolving with me. I will try to keep it and my blog up to date. Do get in touch if you want to know more.